This isn’t hype people. This is the real deal. I am not lying when I say that I have developed the best gluten-free vegan cookies known to humankind. I do have someone to thank for this—Alton Brown. Alton did a Good Eats episode called Sub Standards that dealt with culinary substitutions and replacements, and thus was born his Chewy Gluten-Free Chocolate Chip Cookie. If anyone didn’t know, I have an extreme and perhaps weird crush on Alton Brown. While he does sometimes promote things that aren’t complete fact, for the most part he has a great knowledge of food chemistry. And this knowledge is very important when you are trying to remove things from food items that upset your system. As some of you know, I am dealing with some health issues right now and am currently going through an elimination diet (not low calories, just removal). In my normal daily diet I have to have chocolate. It is a part of my blood and oxygen supply. It is also one of the few things I don’t have a problem eating. Since I can’t eat peanut butter or dairy (two of my favorite things), I was going to be damned if I didn’t eat chocolate. And my favorite means of chocolate delivery is via the cookie. Oh, But Wait, I Can’t Have F**king Gluten! What Am I Supposed to Do? Well, I was enjoying Lucy’s Chocolate Chip Cookies, an amazing cookie by the way, but I honestly can’t justify the cost and apparently the stores can’t keep up with my demand. So I said to myself—you must make the cookies! It turns out that this plan was brilliant on many levels. 1. Homemade cookies taste way better. Who doesn’t enjoy the taste of fresh baked cookies? No one, that’s who. 3. You have to work for it. It burns more calories than opening a box. 4. You dictate the size. Smaller cookies means more physiological pleasure. 5. Cheaper as a muther! Gluten-free cookies are expensive. My version costs $5 for 60+ cookies. You can make them for cheaper still if you buy flour and chocolate chips in bulk. This cost is based on a simple grocery store trip. Alton’s recipe had a few problems for me. First, it had dairy and I can’t eat that right now. The other is the fact that it was pretty high in calories. Now, this recipe is in no way low calorie, but it certainly is LOWER in calories than the original. Also, let me make it clear that I am not, in any way, saying that anything is wrong with regular chocolate chip cookies. So with that being said, I would choose these over Nestlé® Toll House® cookies anyday. Aside from that, I made small adjustments to the sugar content, oils, and flour/starch combos. Lastly, I have no qualms about saying these are the best because they are. 1. In a medium bowl, sift flour, starch, xanthum gum, and baking soda together. 2. In a large bowl, melt butter and mix with the sugars. 3. Add oil, milk, egg white, and vanilla extract to the butter/sugar mixture. 4. Slowly add the sifted flour to the sugar mixture and combine thoroughly. 5. Cover bowl and place in refrigerator for at least an hour. 2. Place parchment paper on a large flat cookie sheet. 3. Use a spoon to scoop out whatever size of cookie dough you want and place it on the baking sheet. The larger the cookies, the longer the bake time. Not responsible for taste and quality of oversized cookies. 4. Bake cookies for 20 minutes or until lightly brown around the edges. Adjust time as needed for size and oven. 5. Remove from oven and let cool for at least 5-7 mins before moving. Serve. The real trick is the slow cook. If you get more of a flaky (instead of chewy) result, use a lower temperature next time. Also, do not touch them until they are cool—seriously. Leave them alone. They need more time to cool than normal cookies. I am happy to report my chocolate craving has been satisfied. I look forward to the day when I can return to more of a normal eating pattern for myself—so far though, it hasn’t been so bad. and off to Whole Foods I shall go. I had a similiar recipe with cardamom than even my girls (4 and 2 and 39) love. I am going to have to try these this weekend! I am a great cook and baker, but I can NEVER get my chocolate cookies to turn out. Now, my oatmeal choc chip ones on the other hand turn out quite nice. Question, when you say “Let cool out of the oven for at least 5-7 mins before moving. Serve.” Do you let them cool on the cookie sheet or pull the parchment paper with the cookies still on it off onto a cooling rack? I let mine cool on the Parchment Paper. They can’t take an initial move to a cookie sheet out of the oven. Leigh – I love Alton Brown too! My hubby and I have been watching him for years. We have every show DVR’d! I will definitely try these and I have no problems with gluten or dairy!!! I’ll definitely be trying this recipe! What does it say about me that I have all of these ingredients on hand? One slight quibble – the recipe title in the body of the post says it’s vegan, but the egg white means it’s not. I’m going to try it using my Ener-G egg replacer and hope for the best, since I am vegan. OK. These sound awesome. I am going to have to try. One small correction: as listed, the recipe is actually not vegan because of the egg white. But that’s easily substituted with a “flax egg” – 1 tbsp of flaxseed meal mixed with 2-3 tbsp of water. Thanks for sharing with us! I have no idea why I put vegan in the sub-titile. I must have been thinking about something else. It has been removed. You are not the first, Leigh. People often forget about the egg for some reason. My mom recently proclaimed, “I got you a vegan dessert: chocolate covered macaroons!” As I bit into a delicious coconut macaroon (proudly listed on the package as dairy and gluten free, I later discovered), I asked her – “are you sure these are vegan?” since in my pre-vegan days I made macaroons several times with egg whites. And she realized the mistake. Speaking of which – chocolate covered macaroons are also a gluten free, dairy free way to get your chocolate – in a cookie form as well! Awesome, thanks for the recipe. lol, putting chocolate in a dessert dilutes the chocolate! that is my gut feeling, although i like chocolate in most any form. and home baked cookies smell so good. Ah see Natalie, I believe in lifting the chocolate to a new level with a complementary item. Chocolate on its own is great, but in a cookie with the butter, flour, and texture…oh man, it’s like bee’s to honey. Yay! I’m excited to try this recipe! I’d like to order one dozen, to be shipped immediately. The company will see what we can do. After all, I DO owe you some cookies. Given that you’ve mentioned trueprotein.com in the past and also hinted at your own struggles with potential food intolerances/ferreting out possible culprits via the oftentimes tedious process of a food rotation diet, I was wondering if you have used any “hypoallergenic” protein blends from True Protein in your diet. I am really not a fan of the brown rice/pea/hemp protein powders. Don’t get me wrong, I use them, I am just not a fan of them. Thankfully I can have egg protein right now and it isn’t an issue. A friend hooks me up with Sun Warrior, which tastes the best yet out of all vegan protein powders I have tried. So normally I do egg and I keep it switched up with the Sun Warrior. So I haven’t order their stuff, but the company pays extreme attention to their products and I would imagine their vegan/hypoallergenic brands would be quality. I do know that Sun Warrior does this too, but are more expensive. I just randomly stumbled across your blog, and I’m excited to see that your gluten free! I will have to give this cookie recipe a go, but I’m pretty partial to using almond flour in my recipes, to lower the carb content. If you have a chance, you should check out Elanaspantry.com. Her cookies have about 5 ingredients, which makes them sooo simple. 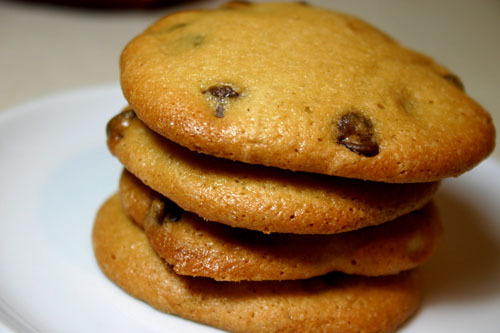 She also has an amazing chocolate chip cookie recipe, that I make my boyfriend at least once a week! I use coconut oil, or grass fed butter instead of grapeseed oil, and use honey instead of agave nectar (which I half) and dark chocolate chips. These treats never last more than a day! Well, technically my blog is not gluten-free. I am only currently eating that way for health reasons due to some problems I am having. I will be releasing a gluten-free cookbook with a focus on protein in the future, but there are a large variety of recipes and types on my blog. My diet is gluten-free, non-dairy vegetarian right now, but that isn’t how I plan to eat for the rest my life unless I had to. I love that video! Thanks for sharing! My favorite thing in the whole world to eat is warm chocolate chip cookies with ice cream on top!!! I will have try this version and see how it compares! I love that your recipe includes weighed ingredients as opposed to measured in cup measurements. I’m moving more and more towards listing ingredients in this way. It’s a much more accurate way of measuring. I have a recipe for gluten free chocolate chip cookies on my blog which I will eventually convert to weighed measurements as well. Love your blog and will return again, for sure! this looks delish!!!! thanks for the recipe!